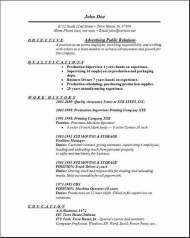 Advertising Public Relations Resume documents are at the bottom of the page. 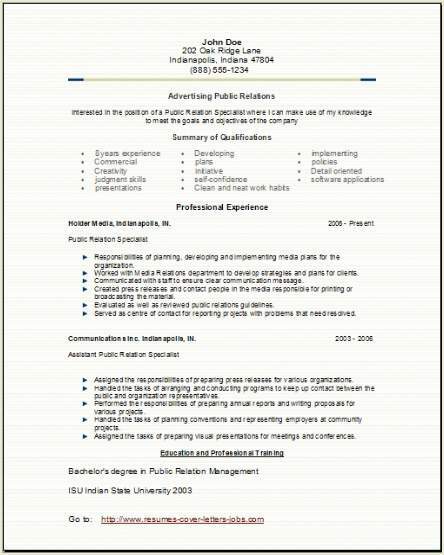 An advertising public relations resume should state your qualifications in a professional manner. Clearly, it will need to make you stand out for the position you are trying to get awarded. So you will want to condense all your qualifications to create the most powerful presentation of you resume to your prospective employer to help you win the job. Some helpful information to guide you on your way to success. For your reference, we would like for you to bookmark us now. Do lots of research on your past work experience before starting. Organize your work experience into one of our templates. Refer to our other samples from this website until you have found the format you like. Make sure there are no spelling errors on your finished resume when it's completed. Enter all your data following the guidelines below. 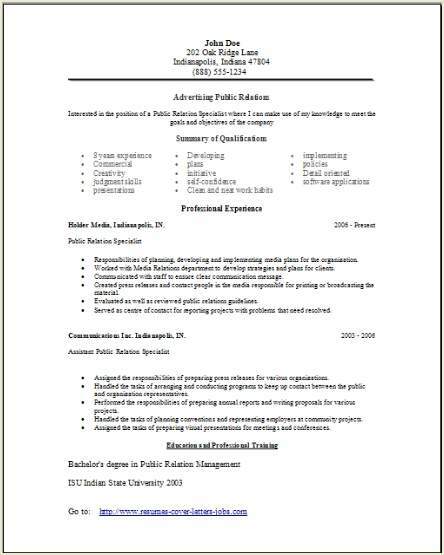 Objective: State the public relations field you are looking for and a few related skills. Summary: Here you will recap quickly your experience: A Example is provided below. Seven years experience in Public Relations, participation in New York cities Macy’s parade organization program through the implementation of commercial campaigns. Education: Start with your highest attained degree first. Skills: Create a bullet list and state all of your job related skills related to the position that you are looking to fill. Using action-words when you can, and also add all of your computer skills. Experience: List your most recent experience first. Activities: Memberships or your activities in professional organizations you belong to etc. Personal: List all your Certifications, any special awards you have, etc. Be short and to the point with your descriptions. Include the Job Objective you are wanting. Using action verbs helps to describe your job specific duties. Do not include any personal information. List your information using bullet style, do not use paragraphs. If you land a job in public relations or the advertising services industry, you will work with a team to help prepare and suggest advertisements for different companies or organizations then you might design some campaigns to promote the image and objectives of those companies clients. The work in this industry will undoubtedly include media representatives—or firms that,-- with you on the team, will sell lots of advertising space using multiple publications, various radio stations, broadcasting television stations, and the Internet. You will also sell business for display advertisers—that are businesses engaged in developing and designing display ads, created for the public mostly used in shopping malls, pasted on billboards, and similar media, and direct mailing advertising companies. You will be dealing with these businesses above on a daily basis. Also any firm that may purchase advertising time (minutes or hour) (or space) from any chosen media outlet, then if you are reselling it to many advertising space agencies or to any individual companies on a direct monthly basis, it is then also considered to be an agency that is buying media. Those that you will not be dealing with are companies that often produce on their own and then put in place, on their own, to the public their own advertising would not be considered to be part of this huge industry.